Video About Charm Pro Makeup Brushes | Vanity and Everything in Between. I bought the Charm Pro Makeup Brush set last 2010 when it was first released. Yes, the price is comparable to other professional brush sets out there. What makes the Charm brushes stand out is the fact that every brush in the set has a vital purpose - unlike other brush sets that include several useless brushes. It's not all about the count piece, baby. 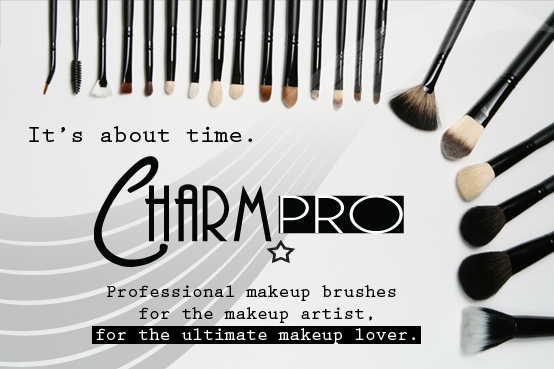 So, here's a rundown on the Charm Pro Makeup Brushes. It goes without saying that this brush set is a must-have. I also included Charm tool belt! It retails at PhP999. The other two brushes are Charm's flat top brush and the shading brush from Charm's latest brush set which is the vegan brushes. I'm thinking of buying the whole set, too, but I really don't know when. That's how much I love Charm brushes! Please subscribe to my YouTube channel and like my page on Facebook!